The genus Salinicoccus in the family Staphylococcaceae was first proposed by Ventosa et al. (1990) and is defined as moderately halophilic, aerobic, Gram-positive, non-motile, non-sporulating, and heterotrophic cocci . The genus name is derived from the Latin adjective salinus, saline, and the Greek masculine noun kokkos, meaning a grain or berry, i.e., saline coccus . 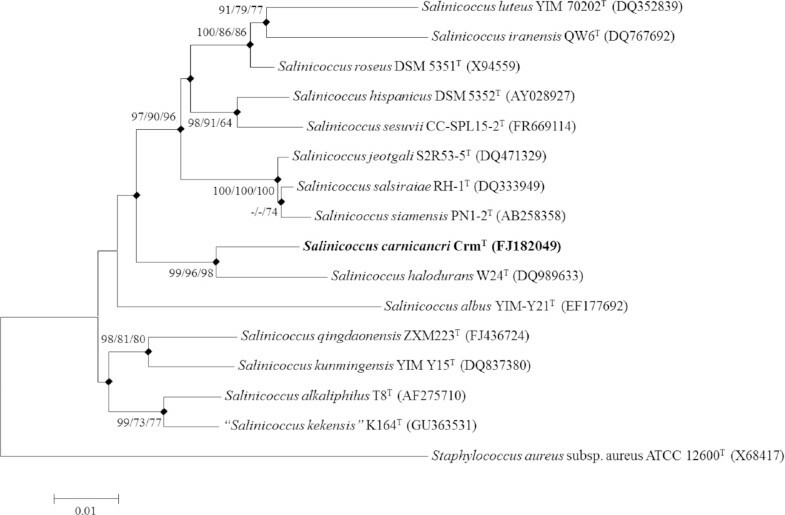 Most species in the genus Salinicoccus have been found in salty environments, such as fermented foods [3–5], solar salterns [1,6], salt mines [7,8], a salt lake , and saline soils [10,11]. All type strains of Salinicoccus species were characterized as halotolerant organisms, where NaCl concentrations of 2–20% (wt/vol) were suitable for growth [12–14]. Strain CrmT (Table 1) was isolated from the fermented seafood ganjang-gejang during a project that investigated microbial communities in fermented foods, i.e., the Next-Generation BioGreen 21 Program (No. PJ008208) in Korea. Ganjang-gejang, with a NaCl (w/v) concentration of 24.5%, was produced by preserving scabbard crabs in soy sauce, garlic, and onions at −5°C for 4–5 days. S. carnicancri strain CrmT is a Gram-positive, moderately halophilic, non-motile, non-sporulating, and aerobic heterotrophic coccus with a diameter of 1.0–2.5 µm . Figure 2 shows the morphological features of strain CrmT, which were obtained by scanning electron microscopy (SEM). Colonies were ivory-colored . Growth occurred at 4–45°C, with an optimum of 30–37°C, and at pH values of 6.0–11.0, with an optimum of 7.0–8.0. The salinity range suitable for growth was 0–20% (w/v) NaCl, with an optimum of 12% (w/v) NaCl . Strain CrmT contains menaquinone MK-6 as the predominant respiratory quinone . The major fatty acids (>10% of total fatty acid) are anteiso-C15:0 (40.61%), iso-C15:0 (22.0%), and anteiso-C17:0 (12.12%) . The major cellular polar lipids are phosphatidylglycerol and diphosphatidylglycerol . Glycine and lysine are the major amino acid constituents of the cell-wall hydrolysate . Scanning electron microscopy images of S. carnicancri CrmT obtained using a SUPRA VP55 (Carl Zeiss) at an operating voltage of 15kV. The scale bars represents 200 nm (left) and 1 µm (right), respectively.